Ceviche is a classic Latin American dish usually featuring fish cured by either lime or lemon juice. The high acidity of the juice causes the fish items to be "cooked" and they are then served cold. Despite some noticeable benefits to cooking with this method, such as no smoke or use of butters or oils, there is no recipe to be found that extends this method to other food items. In this experiment Scientific AmeriKen will crash into the world of breakfast and attempt to ceviche an egg! Technically a variation of pickling, the acidity of the citrus solution in ceviche changes the structures of the proteins in the fish to "cook" it (as mentioned in this recipe). 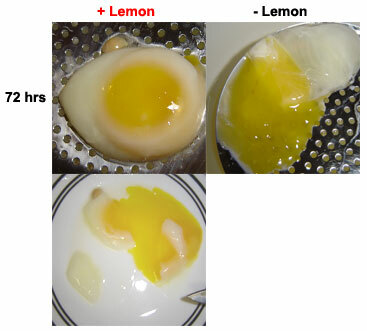 It is the hypothesis of this experiment that similar changes will occur in the proteins in an egg to produce the cooked effect. Materials for this experiment include two bowls, saran wrap, water, lemons, salt, and eggs. The first step is to break each egg and pour into the bowl so that the yolk stays intact. Then juice enough lemons to gather 1 cup of juice and add 1 teaspoon of salt to it. Apply this mixture to the egg and cover with saran wrap and placed in a refrigerator. Pour 1 cup of water over the control egg and cover with saran wrap. 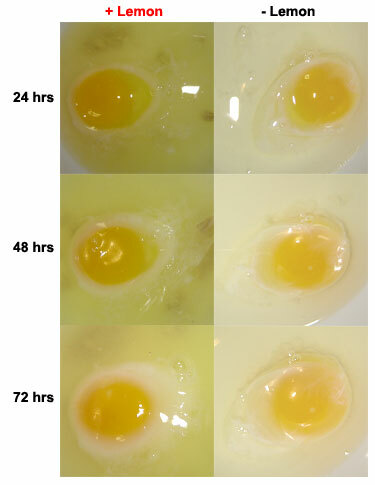 Eggs were photographed after 24 hrs, 48 hrs and 72 hrs. Pictures were taken at time points indicated. After 3 days the contents of the bowls were extracted and photographed. The ceviched egg was then cut in half to examine the yolk. A small portion (~.25 g) was then extracted and eaten. 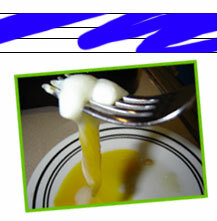 The taste was described as bland and "not egg-like". Extreme nausea nearly leading to vomiting was noted 10 minutes after ingestion. Based on the near death of Scientific AmeriKen - it was determined that using the described technology to "cook" eggs is not possible. Several factors may be cited as the reason for the unsuccessful trial including: Not using an air-tight container for the process, not using enough lemon juice or salt, using bad eggs to begin with, or leaving the eggs for 3 days to cook. Despite these possible reasons no second attempt will be made to rescue this process as Scientific AmeriKen hopes to discover many other things before putting his life on the line. Special thanks to Claudia Recinos for her contributions to this experiment! !